This invigorating foot cream helps hydrate and soothe dry skin on feet, toes and heels. Great foot cream. 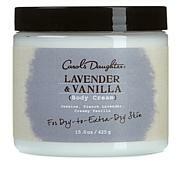 The scent is wonderful and this cream keeps the bottoms of my feet so soft and smooth. I even apply some around my ankles as I'm putting it on my feet. Absolutely wonderful for feet especially after a shower or a pedi! This cream did not disappoint. The fragrance was nice and my skin reacted very well. I used twice a day and my feet were soft. This is a good heavy lotion product. Love the fragrance. Unfortunatly claims to use more natural products in ingredients, not true. After I did research on the ingredients listed found to use just as much and many chemicals as store brands, just called something different.